I have been visiting sunny Petaluma CA the home of two of my favorite places Alvarado Street Bakery and Mrs. Grossman's Sticker Company. Last year I went on tours of both places, met Mrs. Grossman herself and wrote an article on their eco friendly manufacturing processes for Homearts magazine. The company is located on the the banks of a park wetlands with large glass windows open to a beautiful view. When we arrived one of the employees was heading in with her dog. The place is bright, friendly and welcoming with tours given and a store on site. There is a big sale going on this week so I did stock up on some items. It is such a delight to visit and reconnect with the people I interviewed last year. It was a wonderful time spent in a lovely place that creates whimsical, fun, bright stickers and products. 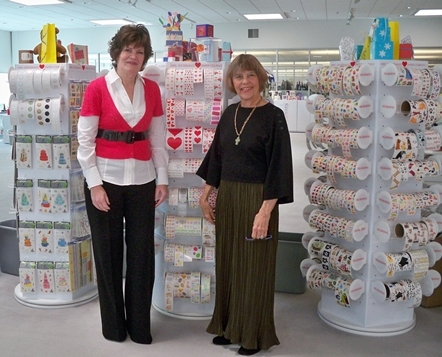 It all began with a heart sticker, one woman's vision at a kitchen table. Thank you Andrea Grossman! Debra, what a great way to spruce up some cute boots. I love this idea!